Chicken pieces in a tangy tomato gravy with cilantro and green chillies. This tomato chicken recipe will elicit a lot of oohs and aahs! 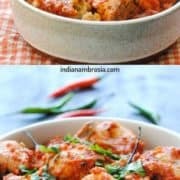 A tomato chicken recipe to put the senses in a tizzy and make you reach out for more! Is it the vivid red and green colours of the tomato, the cilantro and the chillies? Or the thick, shiny gravy wrapped around the chicken? Or the tanginess that hits your tongue as soon as you bite into a fat, juicy chicken piece ? I don’t know! But I do know that I have a winner on my hands, each and every time. Plus (a very big plus) is that it’s ridiculously easy to make with just a handful of ingredients – throw together chicken along with some whole spices, ginger-garlic paste and tomatoes and that’s about it. The cilantro and green chillies are garnishes and if you don’t have them, no problem! The tomato gravy will taste just as delicious without. Enjoy with fresh naan or any Indian bread of your choice and a salad! Heat the oil in a pan and add whole spices. When the spices turn golden (1 to 2 minutes), add ginger-garlic paste. Sauté for one minute and put in the chicken. Cook until the masala coats the chicken and it loses its whiteness (10-12 minutes). Keep turning the chicken pieces so that they are evenly coated with the masala. Add the tomatoes and salt and cook on medium flame, covered for about 30-40 minutes. The gravy will first turn watery because of all the tomatoes but as it cooks, the liquid will evaporate, the tomatoes will soften to a mush, and the oil will leave the sides of the pan. Do uncover and stir once or twice to make sure the contents do not stick to the pan. Add the sugar at this point and mix well. Take out the tomato chicken in a shallow dish and garnish with cilantro and green chillies. Select ripe, red tomatoes for visual appeal; the pale ones won’t do your dish justice. Ginger-garlic paste is readily available but it’s not difficult to make your own batch at home. Just grind equal quantities of ginger and garlic with a little water and use the amount the recipe requires. Store the rest in a covered container in your fridge until the next use.